ACDSee 14.3.168 Free Download - ACDSee 14: Organize. Perfect. Inspire. Last Updated: 8/13/2012 | File Size: 73572 KB | Price: $79.99 | Downloads: 441 | Developer: ACD Systems International Inc.
ACDSEE 14 Organize. Perfect. Inspire. ACDSee 14 has everything you need to take control of a growing photo collection, perfect and add the latest effects to your images, and share your memories with friends and family. Quickly find and organize photos, perfect them with easy-to-use editing tools, and unleash your creativity with super-simple special effects. Then share your images through e-mail, social media or your own 10 GB space on ACDSee Online.com. Go ahead, inspire yourself! 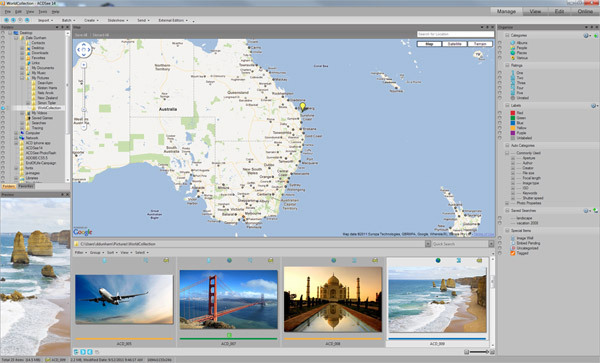 A host of new features make ACDSee 14 the most complete, most powerful photo editing and management solution for home or business:New features: Map view and Geotagging Support Custom Metadata Panel Color Labels Free 10 GB ACDSee Online account Drawing Tools Cloud Sync New Special Effects. Manage: Stay on top of your growing photo collection with all the time-saving tools you need in one easy-to-use product. Unlike other photo software, ACDSee 14 doesn't impose a one-size-fits-all system. Manage your photos the way that works best for you, so you stay in control. View: Spend more time enjoying your photos instead of waiting for them to open. ACDSee's viewing speed is second to none because there is no need to import your photos; ACDSee lets you work with them directly from their original locations. Review your latest shots, browse instant slide shows, and enjoy full-size previews. Any way you look at it, ACDSee works fast. Edit: ACDSee has everything you need to make your photos look their very best. Go ahead and inspire yourself with easy-to-use, professional caliber editing tools and special effects. Your originals are always preserved, so you can go back and start over again anytime. Now that's worry-free editing! Share: Simply drag and drop files from ACDSee 14 to your free account on ACDSeeOnline.com. Keep your photos private, create public albums to showcase to the world, or share via email or social media.